"A perfect way to make a sweetened acorn squash to serve up as a side dish to any meal. 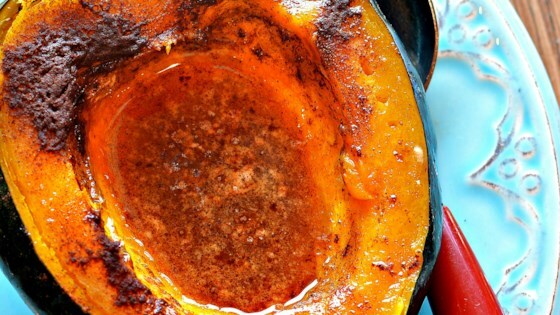 This sweet acorn squash cooks up in 25 minutes using an electric pressure cooker." Divide sugar, maple syrup, butter, and cinnamon between both halves of acorn squash. Add 1 cup of water into an electric pressure cooker (such as Instant Pot(R)) and place trivet inside. Carefully place squash halves on top of trivet. Lock lid and close pressure valve. Select High pressure according to manufacturer's instructions; set timer for 5 minutes. Allow 10 to 15 minutes for pressure to build. Release pressure using the natural-release method, about 7 minutes. Release any remaining pressure according to manufacturer's instructions. Unlock lid, carefully remove squash, and serve. I did not make any changes to the recipe and it was delicious. Even my picky-eater husband really enjoyed it. And it was so easy in the instant pot that I will definitely make it again. The family loved it. I roasted the seeds with a pinch of salt and a spray of avocado oil at 350 for 15 minutes, they were awesome. I drizzled olive oil and cracked pepper over the halved squash before sealing the pot.